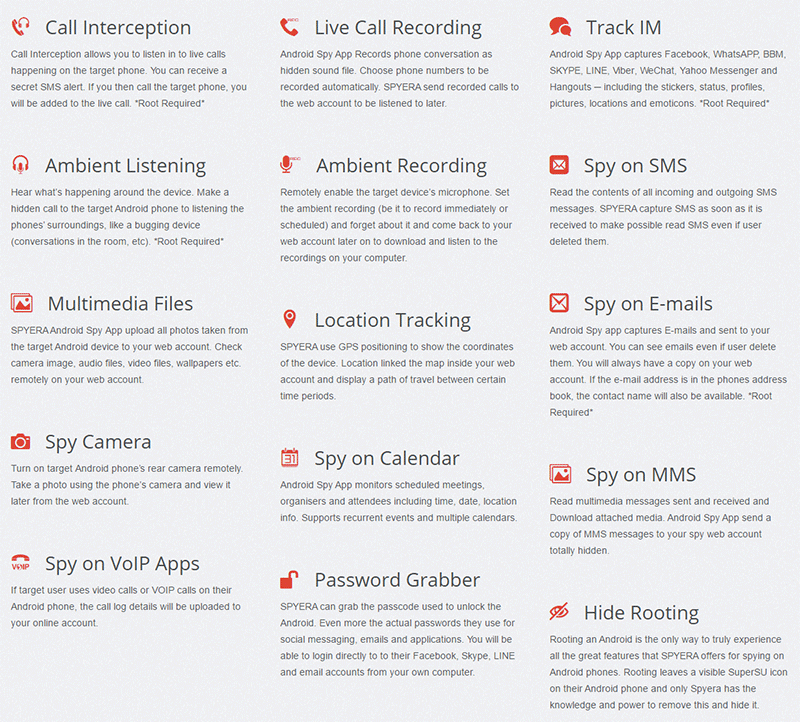 Spyera has come a long way in the last few years, and has grown into a full fledge cell phone spying tool that offers the same advanced features as all the most complete solutions on the market. The company has been around for over close to two decades, being started as early as 1999, making them one of the oldest, and first cell phone monitoring services to have existed. Mixed reviews could be found online, but due to the time span and scarcity of the information available, it was difficult to make a clear call before putting the service to the test. I decided to purchase a three month license in order to see how well, or how badly it performed. Spyera has a very complete suite of capabilities that rivals top service providers such as Flexispy and mSpy. The regularly featured functions are all present, ranging from collection phone call logs, text messages, address books, emails and multimedia files, such as pictures and videos taken with the device. 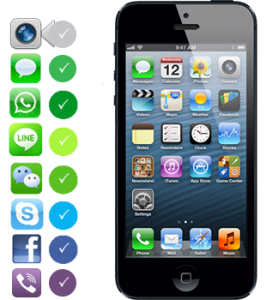 They also support an impressive amount of third party chatting apps, as well as VOIP apps. Pretty much all the social media apps that can be monitored are available, with the exception of Facebook Messenger. The dashboard appears similar to any other cell phone tracking service, which allows you to access all the logged data by app, or type. You can view all call logs, text messages, and web browsing history with timestamps, and even deleted content including emails still get backed up. GPS positioning can be tracked live using the cell phone’s live location coordinates, allowing you to map the device’s exact location with a visual display of travelled paths. Additionally, Spyera is capable of more advanced monitoring and spying functions that only a few competitors offer. Call recording allows you to record and listen to saved calls later on. Live call listening is also possible, as well as ambient listening, which allows you to remotely turn on the microphone and listen in. Remote camera control is also available for rear cameras on iPhone and Android devices, allowing you to view, film and take pictures remotely. Facetime and VOIP calls are also recorded and logged for both cell phones and tablets. Similar to Flexispy, they also offer a rather invasive password cracker which attempts to steal smart phone unlocking codes, as well as a variety of apps ranging from Facebook, Twitter, Google Apps, and even email accounts. More remote functions are available to allow you to control and update the app in stealth mode through remote SMS commands. You can activate, deactivate, update or upgrade the app from your online dashboard, as well as verify cell phone or tablet battery levels, restart the device, and even delete text messages which contain designated filtered words set by yourself. On first glance, the service seems to be very complete, but it does lack any kind of substantial parental control options. A good comparison would be mSpy’s ability to remotely block apps, websites, and any content that parents or employers may deem inappropriate or unnecessary. Unfortunately, this is where Spyera falls a little short. There is no way to restrict or block anything on the target device through their service. Otherwise, besides Facebook Messenger, the service is one of the most complete options available. 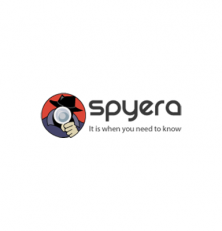 Spyera is compatible with all major platforms, and has not dropped service for older devices running Blackberry or Nokia Symbian operating systems. Different plans are offered for iPads and Android tablets as well. Android 6.0+ – Advanced features require rooting. iOS 5.x – 9.1 – Must be jailbroken to install app. Blackberry OS up to 7.x – V10 coming soon. Symbian Nokia – Any version. Another positive result for Spyera was their stealth test. After downloading, installing and activating the app on both iPhone and Android platforms separately, the service left no visible trace of being present. We did detect a slight rise in battery usage, which is totally normal due to the backups over Wi-Fi, but the service remains completely inconspicuous. This is perfect for employers and parents wishing to keep tabs on their devices without divulging it, as well as proving theft protection and security, in case the device is lost. Customer support during after sale issues was one of the common negative user review topics I came across. Some people we’re complaining that it would take more than a day before getting a response form the helpdesk. Luckily, it seems the company has considerably improved their help desk, and now answer all queries in 24 hours or less. I put the help desk to the test and sent 3 separate inquiries for different types of issues, and was able to get a response in less than 2 hours twice, while one ticket took 12 hours. I don’t consider their ticketing system to be the best service I have seen, but at least they responded in a timely manner and properly answered my concerns with decent agents that knew enough to properly service technical issues. However, given that they don’t have a toll free number, calling long distance is probably not an option, and you’re left with nothing but the ticketing system, as no other alternative such as live chat is currently offered. Spyera offers flat rates across all platforms, but split the plans between Smartphone cell phones, Tablets, or a combo plan for both. Each of the three plans offer different subscription period lengths. Tablet and smart phone plans are available for 3 month, 6 month, or 1 year subscriptions, while the tablet and cell phone combos only offer one or two year plans. There are no stripped down or light packages available, and the lack of cost effective 1 month packages make you commit to a minimum of 3 months. If you search, you can find a 1 month package, but in my opinion, it costs too much to be worth it at $89. 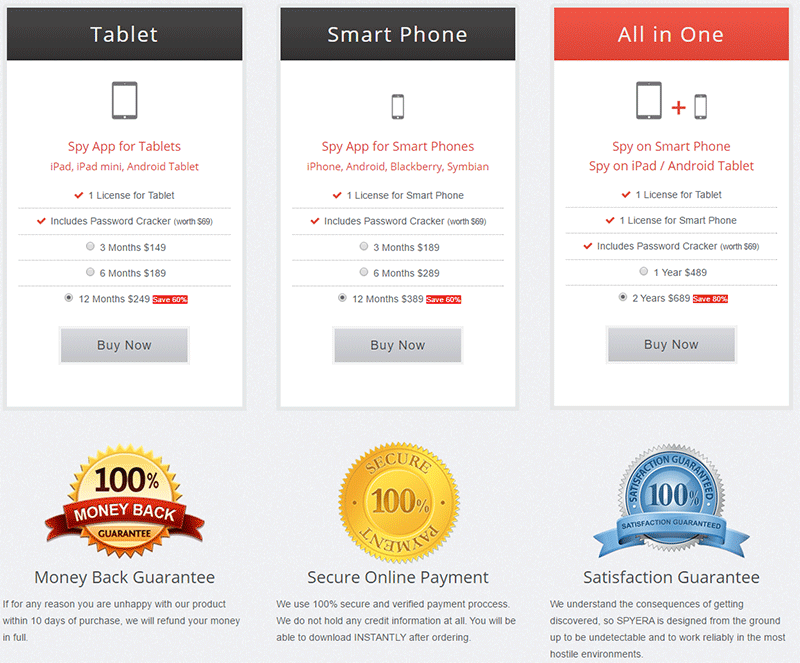 Comparatively to competition, the pricing is almost the same as Flexispy, which offers a similar selection of features. All in all, not the cheapest service, but definitely part of the most complete options available. If you’re looking for advanced remote control camera spying, mic bugging, call and video call recording capabilities, the price is in line with the best of them all, making this a good value purchase considering all features work as advertised. But, I would have liked to see a bigger discount on yearly plans to make it more competitive with Flexispy’s rates. As security, a 10-day money back guarantee is offered if you’re unsatisfied for any reason at all, allowing you to safely give is a test run. After testing Spyera for a little over a month, I spent an equal amount of time on Android and iOS cell phones putting every service to use and logging the results. I was pleasantly surprised that I did not run into any bugs or failures when backing up logs, except for one instance where a WhatsApp chat log came back incomplete after running an update. This seemed to be a one off occurrence since I continuously tested all chatting apps aggressively afterwards. Facetime and VOIP video calls all properly recorded, and I was able to remotely listen in and activate the camera without any troubles. The only downside to this service was the high cost, and inability to block, filter or control the available content on the device. Parents looking to have more control over installed apps, or what websites their kids can visit would probably prefer mSpy’s app. Employers might also need filtering functions, but they can at least rest assured that all activity will be visible regardless. In conclusion, Spyera is in direct competition with Flexispy, by offering a similar amount of advanced features at a similar price, even slightly higher. The two are too similar to easily declare a winner, therefore it may come down to a question of needs and preferences between the two lists of features offered. How do you clear an expired license key on target phone? I bought a new license.